Raspberry Tea Floats are a fruity twist on the popular Root Beer Float, but we’ve skipped the traditional soda and replaced it with a sparkling raspberry herbal tea. 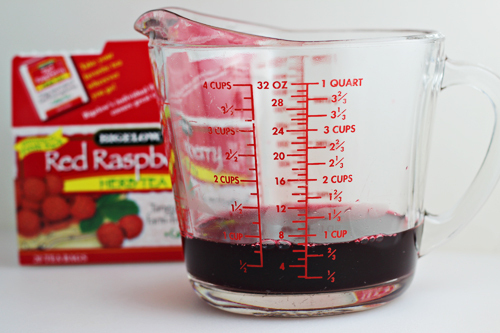 Great for anyone who loves raspberry or for non-soda drinking families. Here’s a non-soda twist on the popular Root Beer Float. 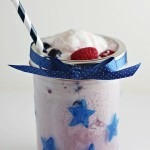 Rather than root beer, these floats use Bigelow Red Raspberry Herb Tea, which gives a beautiful red color that is perfect for 4th of July celebrations. The other bonus is that this is a great way to have floats, without using soda. 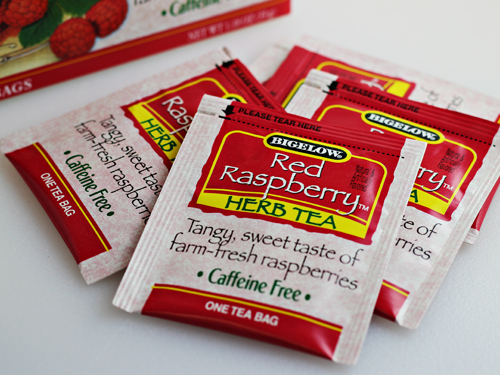 Not only is herbal tea healthier, but it’s a a great option for families who don’t drink soda. 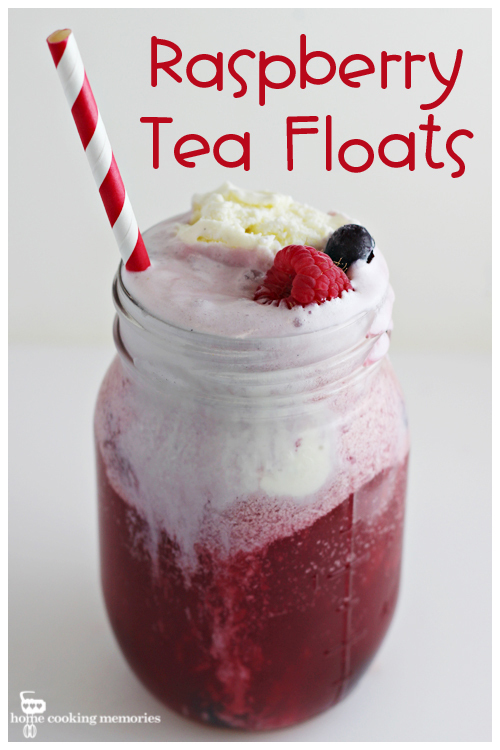 The base of Raspberry Tea Floats is a tea concentrate. 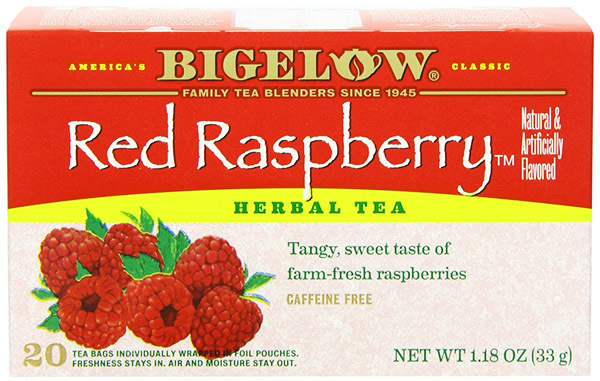 It’s very easy to do: pour 1 cup boiling water over 6 Bigelow Red Raspberry Herb Tea bags. Let it steep for 10 minutes and remove the bags. The concentrate is sweetened with some sugar and then chilled. When you are ready to make your floats, you add in some seltzer water to the concentrate. 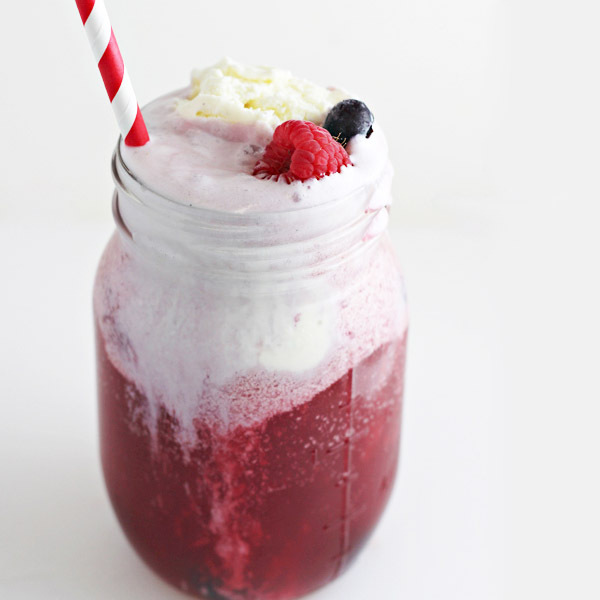 To make your floats, fill your glass about 1/2 – 3/4 of the way with sparkling raspberry tea and frozen raspberries and blueberries and then top with vanilla ice cream. Pour boiling water over tea bags. Steep for 10 minutes. Remove tea bags. Add sugar and stir until dissolved. Refrigerate until chilled. When ready to serve floats, add seltzer water to tea concentrate. 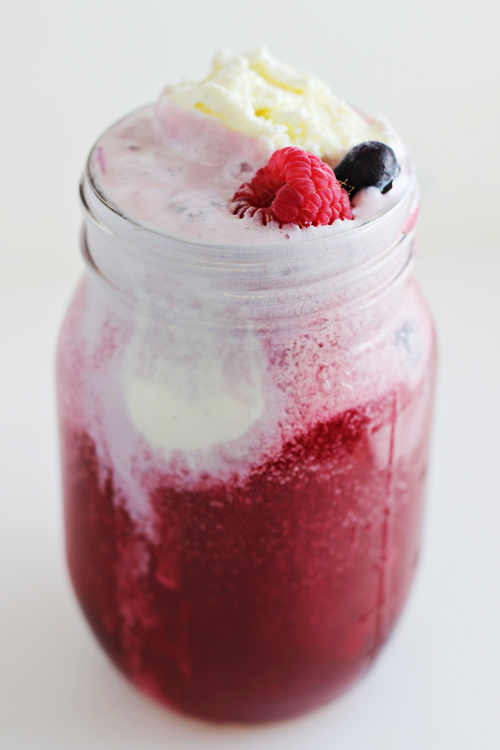 Fill glass 1/2-3/4 full with sparkling raspberry tea first, then berries, and finally with vanilla ice cream. Serve immediately with spoon and straw. That turned out beautifully! I’ll bet it tastes even better! Thanks so much for taking the time to link up with us over at the #HomeMattersParty – we hope to see you again tomorrow! These look good. I could of used this recipe the past two days. We are in a heat wave. Hope to see you again soon. Pinned & shared. Looks delicious and refreshing! Thanks for sharing with Small Victories Sunday Linkup last week. Pinning to our linkup board and hope you joined us again this weekend. So simple, and I love the idea. It looks great as well, plus I love raspberry tea. 🙂 Sharing and pinning! I love refreshing summer drinks like this especially since it’s been so warm here lately. How cute is that? Great idea! I just found your blog and I love it. New follower.